Percona XtraBackup is an open source backup utility for MySQL. It supports all MySQL flavours like Percona Server, MariaDB, and (Oracle) MySQL. Percona Xtrabackup performs a Hot Backup for MySQL. Hot Backup means to create a backup of a MySQL server while it is running without a downtime. In this tutorial, I will show you how to create a hot MySQL database backup with the OpenSource tool Percona XtraBackup on Ubuntu 16.04 (Xenial Xerus). I will use MariaDB as the database server to perform the backup but th same setup will work for MySQL servers as well. Percona XtraBackup is available in the Ubuntu repository, but we want to use the latest version from the Percona repository. Grant the user the following privileges: 'RELOAD, PROCESS, LOCK TABLES, REPLICATION CLIENT'. The new backup user and a backup directory have been created. Innobackupex is a Perl script wrapper for the xtrabackup program. 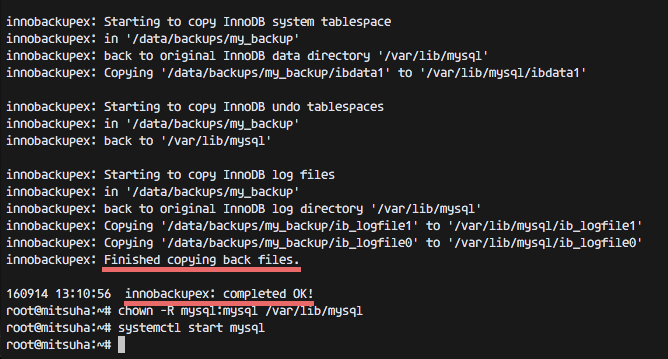 It's a patched version of the innobackup script provided by oracle, distributed with InnoDB Backup tool. Innobackupex provides backup for a whole MySQL database instance, using xtrabackup in combination with xbstream and xbcrypt. In this step, we will create and prepare a full backup for the MySQL instance. In step 2, we've created a new directory for the backup and added a new mysql backup user. We will use them now to create a backup with innobackupex command. --user = user with required backup privileges (step-2). --password = password of the backup user. --no-timestamp = disable the creation of a new time-stamped subdirectory in the backup root dir. /data/backups/my_backup = directory for the backup, it will be created automatically during backup process. If the directory exists, you will get an error message. If there is no directory 'my_backup2', you will get your directory based on 'timestamp' format. After creating a new backup, the data isn't ready for a restore. There is one more step so the data is ready to be restored. We need the 'prepare stage' so the data can be restored. Make sure the process is complete without error before you proceed. The data is ready to be restored now. We can restore it on the same server or on the another server that's running MariaDB. 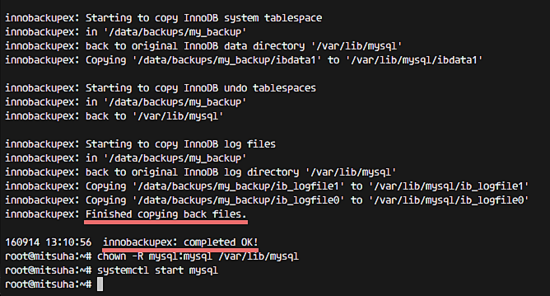 In this step, we will restore the MySQL instance with innobackupex. 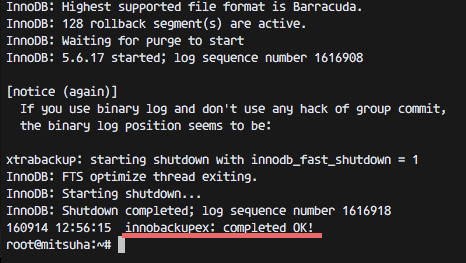 When you see the result 'innobackupex: completed OK', then you have successfully restored your MySQL instance. The MySQL instance has been successfully restored with percona-xtrabackup. We should use xtrabackup instead of innobackupex for new implementations. As per percona documentation innobackupex is the symlink for xtrabackup. innobackupex still supports all features and syntax as 2.2 version did, but is now deprecated and will be removed in next major release. Ermm how do I back up (and possibly restore?) just one database in /var/lib/mysql ?